I know what you're thinking - yet another soup. We basically subsist completely on soup at this point, given the fresh chill in the air and the infinite possibilities of warm, liquid deliciousness. I was planning to post about some other culinary adventures that we've taken recently, but this avgolemono soup that we made tonight was so incredibly delicious that I couldn't wait to share the recipe. Jonathan exclaimed, after polishing off a heartily-sized bowl: "I think that might have been the best soup I've ever had." The picture above was a success in terms of photography, but to be honest, this isn't the most beautiful thing you'll ever eat. Whether it is the most delicious, though, only you can decide. Bring stock almost to a boil in a large pot. When it is barely boiling, add rice, garlic, carrot, white parts of green onions (save the green parts for garnishing), and whole chicken breast. Cover and simmer over low-medium heat for about 20 min., or until chicken is cooked through. 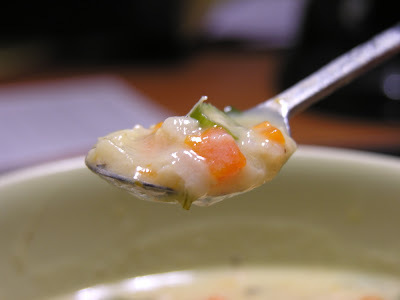 Once chicken is completely cooked, remove from soup and shred with a fork to get bite-sized pieces. Return to soup and continue simmering until rice is soft, about 20 min. more. Meanwhile, beat egg with freshly-squeezed lemon juice until blended. When rice is done, ladle a bit of hot soup into egg mixture and whisk vigorously to temper the egg. Don't let the egg scramble. After whisking for a few seconds, add egg to soup, and whisk some more to avoid scrambling. Continue to cook over low heat (don't let the soup boil) for a few more minutes, just until the soup is thickened. Add chopped chard and stir to wilt. Ladle into deep bowls and garnish with green onion.